In September 2018, Fujifilm announced the successor to its incredibly popular X-T2 model, the X-T3. It was the first of many “third generation” mirrorless cameras to hit the market this year, featuring not only a more powerful sensor and capable autofocus system but also stunning video capabilities that outdo even those of the two heavy-hitters, Panasonic and Sony. 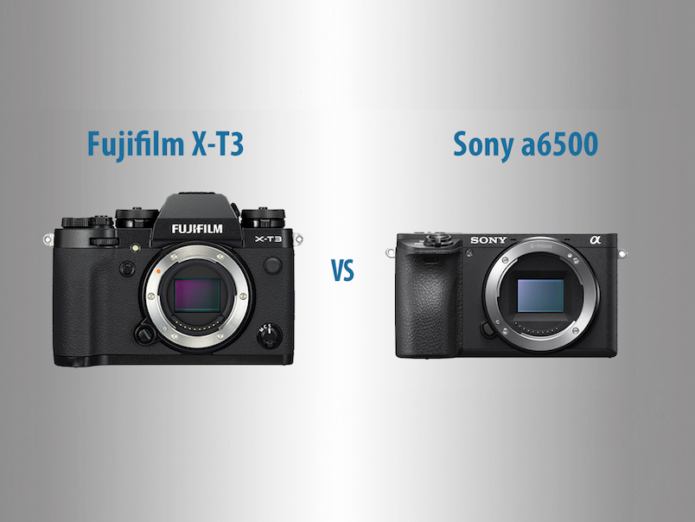 In this comparison preview, we’re going to take a look at the ten main differences between the new X-T3 and one of its primary competitors, the Sony a6500. 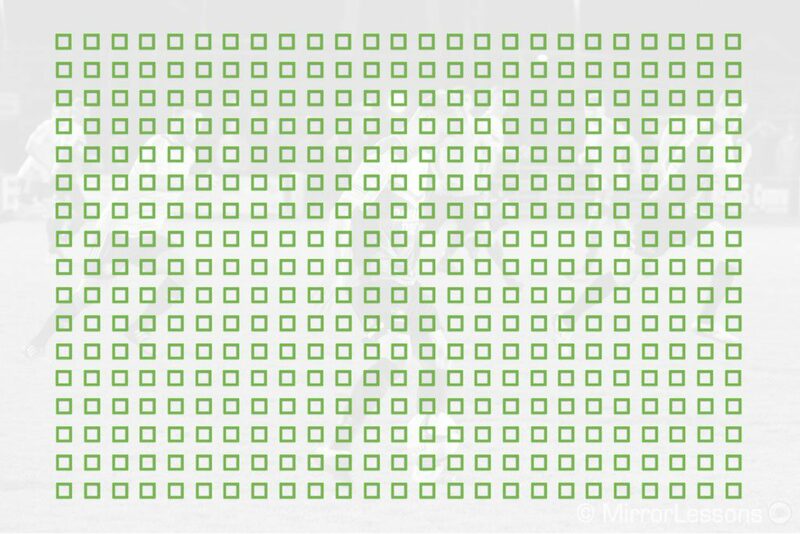 Despite having a number of basic characteristics in common, including an APS-C sized sensor, advanced hybrid autofocus system and 4K video capabilities, there are a number factors to consider before settling on one or the other as we’ll find out below. Physically speaking, one of the most obvious differences is of course the design. The X-T3 has an SLR-like design whose electronic viewfinder (EVF) is found at centre of the body. It is both larger and heavier than the a6500, weighing 539g with the battery and memory card and measuring 132.5mm x 92.8mm x 58.8mm. The a6500 weighs approximately 453g and measures 120.0mm x 66.9mm x 53.3mm. It has a flat-topped rangefinder-type body whose EVF is located on the left side of the body. All Fujifilm X series models bear a strong resemblance to analog film cameras thanks to their traditional-looking dials and buttons. In the case of the X-T3, you have the following: two stacked dials for shutter speed/drive modes and ISO/metering, an exposure compensation dial, front and rear control dials, an AF joystick, and 9 custom function buttons around the body (plus four virtual touch functions on screen). Most Fujifilm XF lenses feature a clicking aperture ring too. The a6500, being smaller, has fewer direct exposure controls. The essential settings can be changed via the top control dial and rear control wheel, and there is also a default PSAM dial on top. However, you do get ten physical function buttons, which compensates for the shortage of external controls. The X-T3 features complete weather-sealing including freeze resistance down to -10°C, whereas the a6500 is limited to dust and moisture resistance. Both bodies boast a fairly prominent grip out front and a hot shoe on top for accessories, only the a6500 has a pop-up flash built into the body. On the X-T3, you have to use the removable EF-X8 flash which comes in the box. Unfortunately only the X-T3 offers two memory card slots with UHS-II compatibility. The a6500 has one UHS-I slot located at the bottom within the battery compartment, rather than on the side like the Fuji camera. Both the X-T3 and a6500 feature an articulating LCD screen on the rear but there are a few differences worth nothing. First is the manner in which they articulate. Whereas the a6500 has a standard two-way tilting screen that rotates up 90 degrees and down 45 degrees, the X-T3 has a 3-way tilting mechanism that tilts up 90 degrees, down 45 degrees and 45 degrees to the side, giving you more mobility for portrait shooting. Second is the way in which touch sensitivity has been implemented. Both cameras allow you to move the focus point but with the Fujifilm camera, you can also take a shot, change settings in the Q menu and activate four different functions by flicking your finger left, right, up or down on-screen as mentioned above. Note that touch sensitivity remains activate even when looking through the EVF. Both monitors are 3 inches in size and have a similar resolution (1,040k dots on the X-T3, 921k dots on the a6500). As for the electronic viewfinders, the Fujifilm’s has more resolution (3.6M vs 2.36M dots) and a larger magnification (0.75x vs 0.70x on the Sony). The eyepoint is 23mm on both. The EVF of the X-T3 has a maximum refresh rate of up to 100fps whereas the a6500 offers a choice between 100fps (PAL) or 120fps (NTSC). A very important difference between the X-T3 and a6500 regards image stabilisation. The a6500 is currently the only Sony APS-C body to feature 5-axis in-body sensor stabilisation, which is compatible with all E-mount lenses that transmit EXIF data. It compensates for five types of camera shake up to the equivalent of 5 steps in both stills and movie modes. 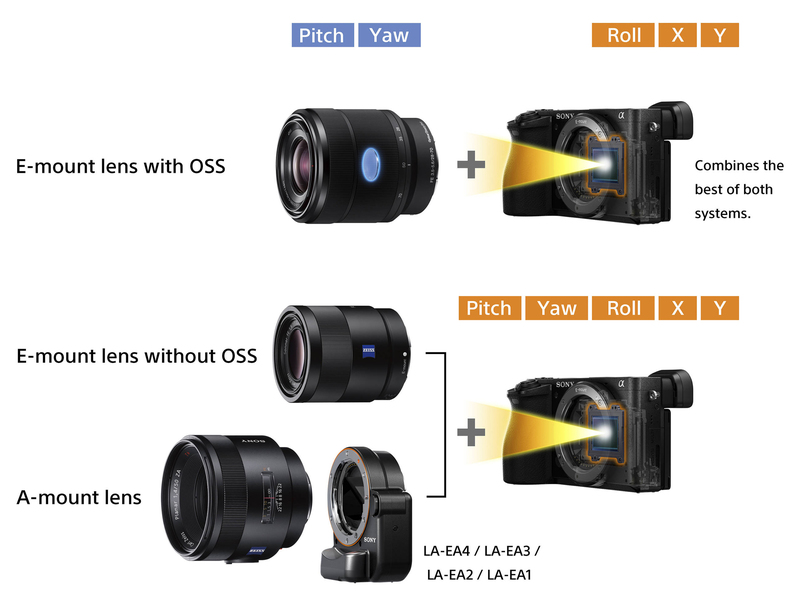 However only three axes are used on the body if you mount a) a Sony lens with optical stabilisation as two axes on the lens are combined with the IBIS, or b) a manual focus lens that lacks electronic contacts. If you want stabilisation with the X-T3, your only choice is to buy Fujinon lenses with OIS which in most cases works very well. Both cameras feature an APS-C sized sensor with a similar resolution (26.1MP for the Fujifilm vs 24.2MP for the Sony) but only the X-T3 has a back-illuminated structure (BSI) which allows for better light collection. The a6500 sensor has a thin wiring layer and large photodiode substrate to help collect light more efficiently. 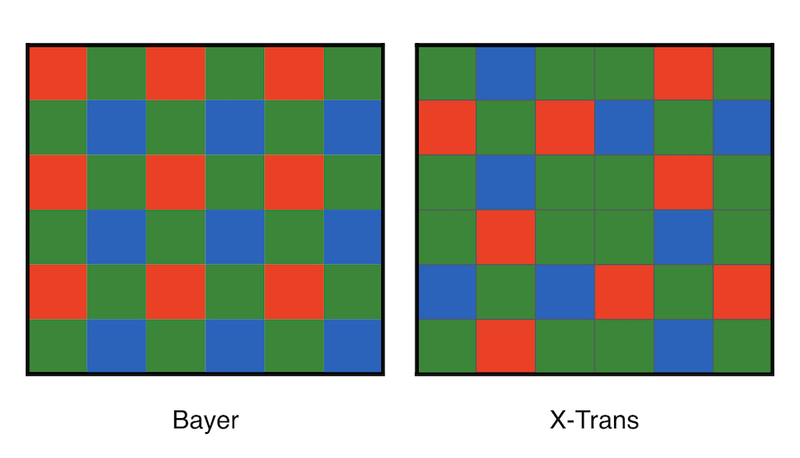 Another difference is the pixel array: the Sony uses the standard Bayer where each line embeds two colours out of three, whereas the X-Trans arrangement used by Fujifilm allows each line to feature at least one red, blue and green pixel. The X-T3 has a native range of ISO 160 to ISO 12800, with optional 80 and 51200 values in the expanded ISO range. The a6500 has a native range of 100 to 25600 ISO that can only be expanded up to 51200. Both cameras sport a hybrid autofocus system with an impressive number of phase detection points. 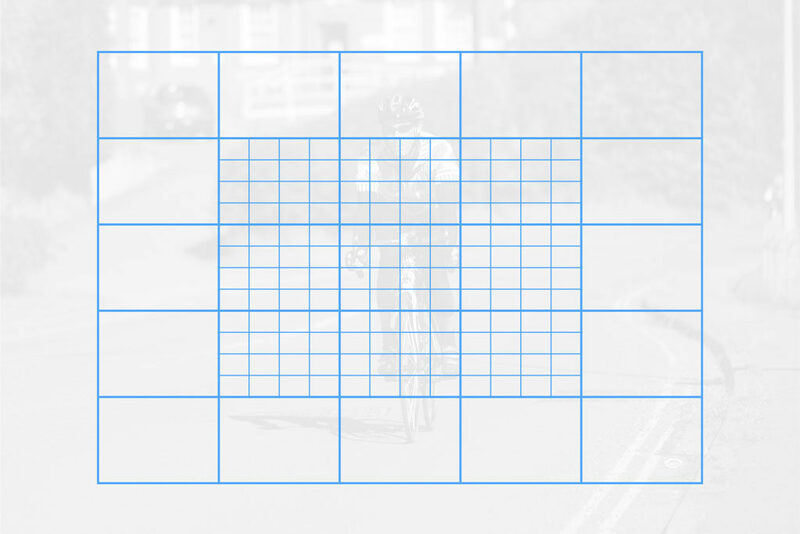 The X-T3 features the most recent iteration whose 117 points (13×9 grid) can be subdivided into 425 (25×17 grid) with certain settings. 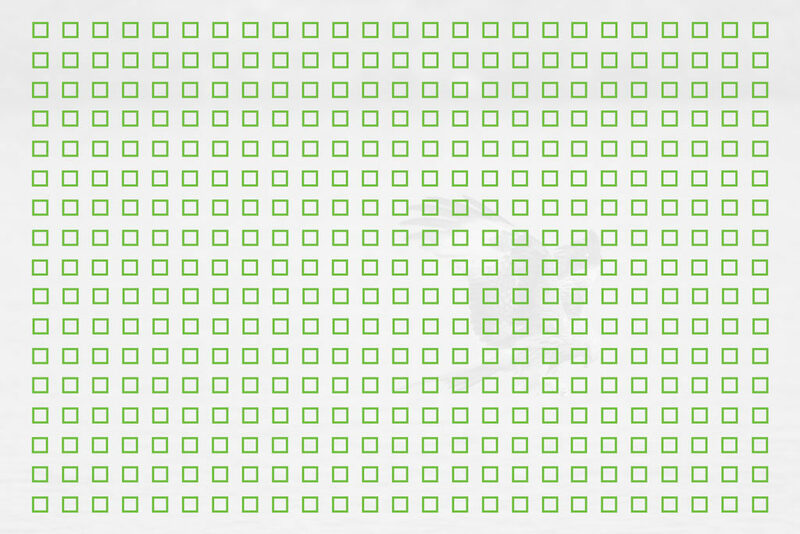 The former covers most of the sensor (91% horizontal and 94.5% vertical) whereas the latter provides near-full coverage (99%) with the 13×9 grid. Like the X-T2 that came before it, there is the possibility to control the continuous autofocus reactivity on the X-T3. It comes with five presets designed for different kinds of action in addition to a sixth option that is manually customisable with three settings (tracking sensitivity, speed tracking sensitivity, zone area switching). The a6500 by comparison has 425 phase detection / 169 contrast detection points across the entire surface of the sensor. It doesn’t feature any additional settings to control the performance or sensitivity of the autofocus but it does benefit from Sony’s extremely accurate Face/Eye Detection mode. 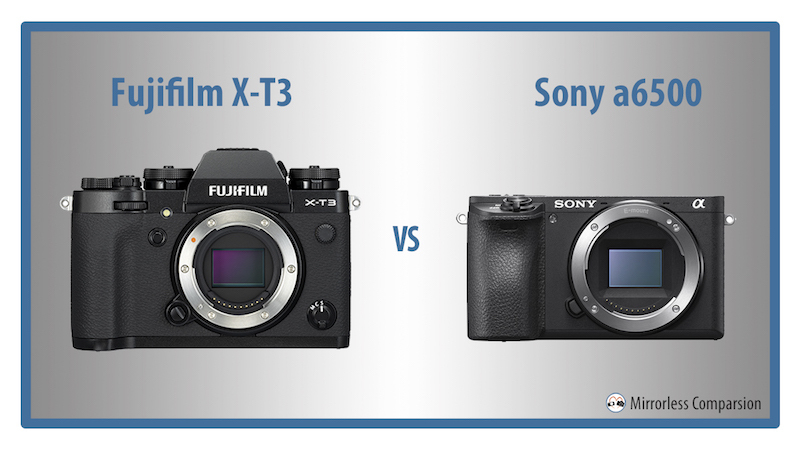 Fujfiilm states that face and eye detection are twice as effective on the X-T3 compared to previous models, so we’ll be curious to see how it compares to Sony’s version. Because the X-T3 has an AF joystick on the rear, it is easier to rapidly move the focus point around the screen than with the a6500 whose four-way control pad can be a little awkward. 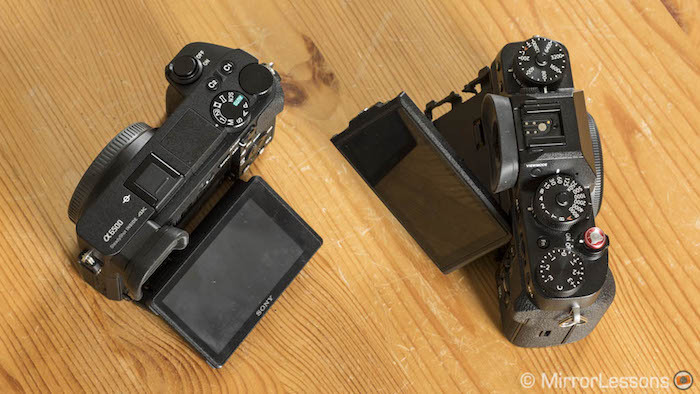 In our comparison between the a6500 and X-T2, we found that both cameras did a wonderful job of tracking subjects for both stills and video, so it will be very interesting to see what kind of improvements Fujifilm has made to the X-T3. With the mechanical shutter, the X-T3 can shoot at 11fps which is the same as the maximum burst capabilities of the a6500. By switching over to the electronic shutter on the Fujifilm camera however, you can raise the maximum burst speed to 20fps, or 30fps with the new Sports Finder mode. The job of this mode is to allow the camera to shoot fast bursts with a true live view (i.e. not a playback of the last image recorded) and zero blackouts between shots in a sequence. The a6500 by comparison offers a live view of your scene up to 8fps but there are short blackouts between images. The advantage of having a live view without blackouts is that it is easier to follow fast and unpredictable subjects such as birds in flight. Something to keep in mind about the Sports Finder mode is that it crops the frame by 1.29x. On the downside, this results in a lower resolution of approximately 16MP but because this crop is displayed in the form of bright lines over the full image area, you also have the advantage of being able to see objects before they enter the frame. You can also use the Sports Finder mode with the mechanical shutter (and the same loss in resolution) if you think the on-screen crop might help you pre-visualise the action, but you won’t get the same blackout-free live view experience. Finally the X-T3 has a maximum shutter speed of 1/8000s with the mechanical shutter or 1/32000 with the electronic shutter. The a6500 is capped at just 1/4000s regardless of the shutter type. The X-T2 marked the birth of Fujifilm’s interest in video, boasting features such as 4K up to 30fps, Full HD up to 60fps and an F-Log flat profile. The new X-T3 takes these specifications to new heights most notably by adding 4K at up to 60fps – a world’s first for a mirrorless camera at that frame rate – and internal recording in 4:2:0 10-bit. It performs full pixel readout across the entire width of the sensor up to 30fps but a 1.18x crop is applied at 50 and 60fps. The a6500 also offers 4K but only at a maximum of 30fps. It performs full pixel readout without any sensor crop or change in field of view. In Full HD, both cameras are capable of recording up to 120fps. The Sony can record with sound, or conform the footage to 25p/30p to produce a slow motion result in-camera. This same mode (called Quick&Slow) also lets you to choose low frame rates down to 1fps in order to speed up the video. 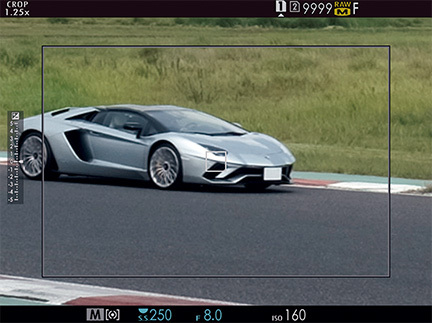 The X-T3 can record at a maximum of 60fps in normal video mode, or 120fps with the High Speed Rec mode. With this mode, the camera performs a sensor crop of 1.29x to improve the quality. The Sony by contrast doesn’t apply any crop whatsoever. The X-T3 comes with two profiles designed for video – the film simulation mode Eterna and F-Log gamma – and a future firmware update will also bring HLG (Hybrid Log Gamma). Support for 10-bit colour depth, combined with 400% (approximately 12 stops) dynamic range, allows the camera to capture richer gradation and more colour information than the 8-bit depth system when recording with either Eterna or F-Log. The a6500 has a total of nine customisable Picture Profiles, thus offering more room for image customisation. The various settings include black gamma, knee, colour depth and two Log profiles (S-Log2 and S-Log3) for internal and external recording via HDMI. As for the maximum recording time, both cameras can manage up to 30 minutes of continuous shooting in 4K/30p and Full HD whereas the X-T3 is limited to 20 minutes for 4K/60p. The X-T3 is pretty well-rounded when it comes to extra features. You get a variety of manual assists including the brand new Digital Microprism assist, a Night Vision mode that turns the screen red and black, as well as bracketing, double exposure and interval time shooting (time-lapse). Additionally, the Fujifilm’s electronic shutter allows for a function called Pre-Shoot where the camera starts to load images to the buffer memory when the shutter release button is half-pressed. Once you fully depress the button to take a shot, the camera saves the most recent pre-loaded images to the SD card. With the exception of bracketing and MF assists like magnification and peaking, the a6500 doesn’t have much to offer in terms of extra features. However you can download a variety of free and paid apps from Sony’s PlayMemories store to boost the selection. Interestingly the a6500 was one of the last E-mount models to offer compatibility with the app store, which means that its successor probably won’t be compatible. Here we have a small difference that is nevertheless worth mentioning. Sony and Fujifilm both offer USB charging but only the latter includes a battery charger in the box. 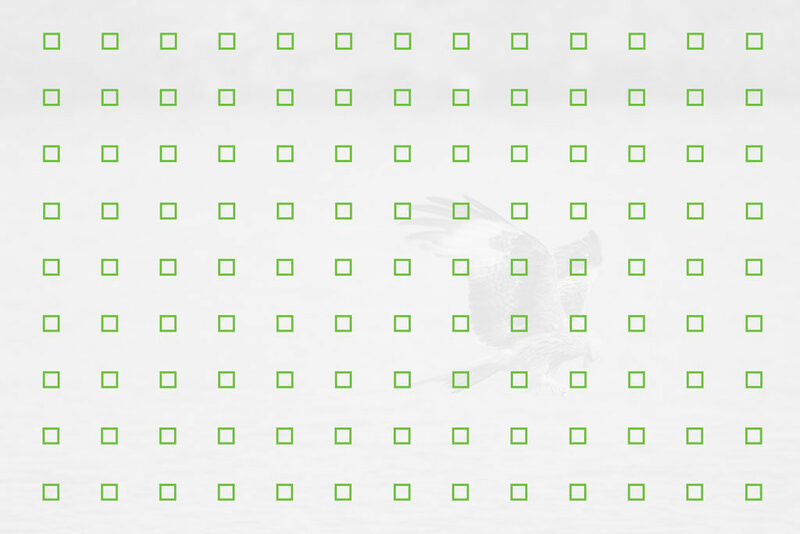 When comparing cameras from different brands, it is easy to fall into the trap of focusing solely on the camera bodies while ignoring the system as a whole. In just five years, Fujifilm has managed to produce a complete lens ecosystem including lots of high-end glass along with more affordable options too. Many of them feature weather-sealing, a premium construction and that all-important clicking aperture ring that Fujifilm users know and love. The selection within the Sony APS-C lens ecosystem isn’t as rich or varied, consisting mostly of slow aperture zooms and f/1.8 primes. This is because Sony is giving priority to the development of the full-frame E-mount lens range. Although they use the same E-mount, these full-frame lenses are often too large and heavy to be a suitable match for APS-C sized bodies like the a6500, not to mention that they can be quite expensive. Happily a few third-party lenses are available for both systems from brands such as Sigma (just the E-mount), Samyang and Zeiss (both E and X mounts). The X-T3 body is priced at approximately $1500, making it around $300 more expensive than the a6500 at its current retail price. This factor on its own might be enough to push you in the direction of the Sony camera but let’s not forget the advantages the X-T3 offers including 4K/60p in 10-bit colour depth, faster burst capabilities, a true live view without blackouts and a better range of native lenses. And while we prefer not to speculate too much about future releases in these previews, it is high time for Sony to announce the successor to the a6500 – or at least another high-end APS-C model. For this reason, some of you may wish to wait and see what Sony brings to the table this year before making a decision.